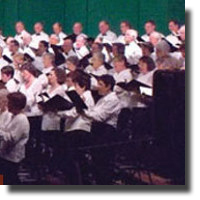 The Berkshire Choral Festival is a weeklong workshop for hundreds of amateur singers from across North America held at various locations both on this continent and in Europe where they work with professional musicians and conductors on large-scale pieces, culminating in a public performance. This year Vancouver has hosted a singing week which offered the opportunity to learn from conductor, Jon Washburn, and to sing with Jenny Such, Anita Kraus, Benjamin Butterfield and Tyler Duncan accompanied by the CBC Orchestra in the elegant Chan Centre for the Performing Arts. What better way to spend a week, rain or shine. The principal work chosen was Healey Willan’s magnificent Requiem for double chorus and orchestra. This is a piece that Willan worked on over a number of years, but like Mozart, did not complete. Its first performance was in 1988, 20 years after Willan’s death. Frederick Clarke, once Willan’s student and now a leading scholar of his music, has pieced together the existing movements, orchestrated them and added accompaniments where they were lacking. One movement, was lifted from Willan’s Anglican Communion Service and gently edited to be sung in Latin. The result is a deeply moving whole. Jon Washburn conducted with considerable clarity. The choir blended well with the CBC Radio orchestra and the voices of the four professional soloists wove throughout like embroidery threads, adding colour yet completely integrated. The expression of the structure of the work as a whole was clear and the varying character of each movement contrasted with the others. In the longest movement, the gradual Dies Irae, fearsome language is set to fearsome music, with many changes of mood. Terror, fear, supplication, hope, each have their turn and their music which was subtly brought out under Washburn’s direction to dramatic effect. It was a pity that the soloists, especially tenor Benjamin Butterfield, could not always be heard. The 180 choristers and the four soloists are to be praised for their diction. Every word could be heard and, even better, was sung as though it was understood. The second half of the program was by Willan’s English contemporary Ralph Vaughan Williams. The “Five Mystical Songs” is his setting of poems by the 17th century parson and poet George Herbert. To Vaughan Williams, as to Willan, words were important and he matches the meditative calm of the poems while treating each differently. The first four are scored for baritone solo with chorus and orchestra. Tyler Duncan sang with intelligence and sensitivity. He began with an impassioned “Rise, heart”, then a simple and joyful “I got me flowers to strew thy way”. With “Love bade me welcome” a dialogue between the Soul and Love, his characterization of the 2 voices, one uncertain, the other constant was delicate and perfect, culminating with Love’s final invitation, “You must sit down..” and the Soul’s acceptance of rapture “So I did sit and eat.” Plainness and directeness characterize “The Call” which Duncan sang with restraint. The last song, Antiphon, like a church hymn, is an exuberant song of praise for orchestra and chorus. “Serenade to Music” is Vaughn William’s ultra romantic take on words from William Shakespeare, “How sweet the moonlight sleeps upon this bank” in which the dialogue is passed back and forth between singers, choir and orchestra. Again the soloists were sometimes difficult to hear. Both pieces embody a diaphanous, rhapsodic beauty which can move an audience to tears. It is a pity that, despite excellent work from all the soloists, the second half of the program could find only period lushness and not the structure and clarity achieved in the Requiem. Reservations notwithstanding, it was a pity the audience consisted mainly of the choristers’ nearest and dearest.